Give Strength to California's Forests! Forests Forever has joined #GivingTuesday, a global day of giving that harnesses the collective power of individuals, communities and organizations to encourage philanthropy and to celebrate generosity worldwide. Please help us continue the fight to protect and enhance the forests and wildlife habitat of California! Occurring this year on November 29, 2016, #GivingTuesday is held annually on the Tuesday after Thanksgivnng (in the U.S.) and the widely recognized shopping events of Black Friday and Cyber Monday to kick-off the holiday giving season and inspire people to collaborate in improving their local communities and to give back in impactful ways to the charities and causes they support. For 27 years now, Forests Forever has been the only non-profit organization that works all year long on protecting California's forests and forest wildlife through broad-based grassroots advocacy. Every day of the week (and on more than a few weekends) Forests Forever organizers interact directly with citizens of the Golden State, making them aware of forest threats and conscious of opportunities to undo and prevent damage done to our forestlands—and too often, to our democracy—by unbridled industry practices. We reach thousands of citizens per year with our urgent message. 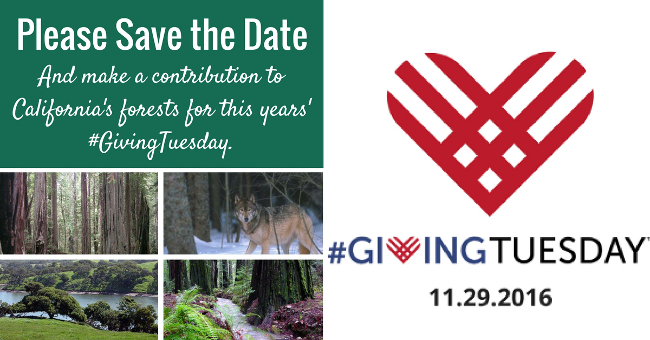 Help us continue the fight to protect and enhance the forests and wildlife habitat of California through educational, legislative, and electoral activities with your contribution this #GivingTuesday! Thank you for your vital help in our work! Your contribution will help California's forests thrive!